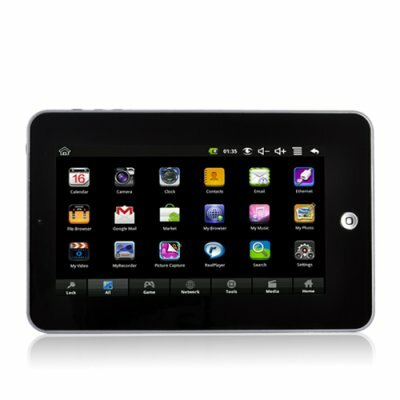 Successfully Added 7 Inch Android 2.2 Tablet with WiFi and Camera to your Shopping Cart. Say hello to amazing multimedia and internet-surfing on the go with this Android 2.2 Tablet. Merging the power of the Android OS with a 7 inch touchscreen, this tablet brings you the easiest way to experience the web, email, multimedia, ebooks, and games at any place, any time. A portable experience like no other: Everything just became a lot easier with this 7 Inch Android Tablet. Browse the internet using WiFi, watch videos on YouTube, read ebooks, send emails, play your favorite games - do whatever you want, when you want. Along with the 800x480 resolution 7 inch touchscreen, the details just looks better and the pictures smoother - a true feast for your eyes. Best of all, with 2GB internal memory and external memory supported up to 32GB, you can carry your favorite movie and music collection on the go and enjoy them anywhere you want. Gain access to everything: Haven't heard of Android? It's only the most popular operating system in the world and includes true multi-tasking, widgets, and many more features that can't be found anywhere else. Best of all, this 7 Inch Android 2.2 Tablet comes installed with convenient applications such as email, YouTube and of course an App Market, which is home to tons of third-party applications ready for you to download. High quality, low price: This affordable 7 Inch Android 2.2 Tablet is the best bang for your buck today and brought to you at a factory-direct price that can't be matched. How do we do this? By cutting out the middle man and selling to you factory-direct with no markup and no extra fees! Available in our warehouse now, this 7 Inch Android Tablet is ready for immediate shipment to you or your customer. Guaranteed to be the next hot item in your online store, order now before everyone has one and make a nice profit for yourself! Brought to you by Chinavasion, the leader in wholesale consumer electronics. App Market lets you download tons of third-party apps and games! This product was formerly CVWF-PC06-XMAS-WHITE [7 Inch Android 2.2 Tablet with WiFi and Camera - White (Christmas Edition)], which was originally meant for the Christmas season only. Due to strong demand, it's back as a regular product! Download your favorite third-party apps through the App Market! Browse the internet for free with WiFi! Note: The Android OS version on this device cannot be upgraded or flashed and any attempts to modify the default OS will void the warranty. As a wholesaler, Chinavasion provides no software support, advice, or training regarding the Android operating system and software. Is this a real Android tablet? Yes! Everything you see is everything you get! This is a true Android 7 Inch Tablet with WiFi, YouTube, front facing camera/camcorder and so much more! Is there official Android Marketplace on this product? The Android Marketplace App can be installed easily. To get the app, please enable the Google apps option under the Settings – Applications Menu.